A heated Taylor Ham vs. Pork Roll debate results in Matt calling me a HORRIBLE NAME!! Ciccone Youth Into the Groovey The Whitey Album Goofin' Pledge $20 to be in the running for this album! The Everymen Ain't Good Enough for You Givin' up on Free Jazz Ernest Jenning Record Co. Pledge $20 and this could be yours! The Everymen NJHC Live on WFMU! The Allah-Las Had it All Worship the Sun Innovative Leisure Pledge $20 or more now and this can be yours! Ex Hex How You Got That Girl Rips Merge Pledge $20 or more now to win this LP! ABBA technically comes before ABC. Will AC/DC be next? or Adam and the Ants? I don't think I'll be awake for ZZ Top. Holy Crap!!! Did I just hear poison arrow by ABC? @Ken from HP: you'll be catching Zs by ZZ Top? @Caryn - Yawning at Y&T, yes. You'll be Xhausted by XTC. I’m going to question my sanity by the time Queen comes up. Good grief! Not "dear god" by XTC? @JakeGould: surely Queen would rather make one question one's sexuality? I'll only accept "radio ga ga" by queen. Unless @threse is daring enough to play "fat bottom girls"
I'm really enjoying "The Buzz Lightyear Show" tonight! Honestly, that YLT request show was really good. Really good. How about you get enough pennies to go into a sock, and then with that sock you go and whack some rich guy on the head, take his money and then—the key—we ALL vouch for you to give you an alibi. What could possibly go wrong? Arctic, Atlantic, Indian, Pacific and Southern. Atlantic Ocean, Pacific Ocean, Arctic Ocean, Indian Ocean and… Billy Ocean. Jake, that's essentially the premise by which governments are funded. Saint Patrick’s Day in about 24 hours. Maybe we could mug a Leprechaun? Or do they have a Sheleighleigh? “What Goes On” is my fave. Turntable 3 needs fixin' too. haha, no sweat. the two words go together quite well and roll off the tongue, all too easily apparently! I sprinkle my pledges as well. Don’t say PADAWAN! And don’t say Cuh-ZEEE! Last year Swag For Life members got a WFMU ouija board fridge magnet! Do they get a knit hat? We tend to hear more from Billy Murray here than Bill Murray. I remember Seth Rogen jumping into a dumpster pool on Letterman, but not Bill Murray... Did I miss Murray jumping into a dumpster pool? Dammit! Vibrating at a higher level? In Groundhog Day, Murray kinda does what Ernie Hudson tells Aykroyd to do in Ghostbusters: he confidently calls himself a god ("Not the God, a god. "), if asked. Cos if we don't pledge there may not be one for wfmu. The first time I was at WFMU was to help send out swag. I folded a couple hundred t-shirts and stuffed other swag into envelopes. I like the idea of little tags that say, "T-Shirt folded by ______" included in that envelope. @rw: Like the name of bag makers at the bottom of brown paper bags? to fold those t-shirts like a champ!!! now i spend my spare time counting t-shirts. Of all the retail skills I learned, folding t-shirts never came on my radar. Bethany once told a story about Bill Murray handing her a $1000 donation for FMU. It was apparently all the money he had on him. Koozie is a registered trademark. Like Kleenex and Q-Tip. Go Therese! Bennies rule! Locals drool! @Ike: You know it’s fairly known fact that Bill Murray deals in cash. Seriously. I think Wes Anderson paid him for “Rushmore” with a suitcase of cash. Also, calling Therese a "bennie" seems a bit dangerous as well. Is Bennie about Benneton? Or… I need backstory on that slur. Can I put my can of pop in the beer cozy? It's an acronym for the train stops they came from. or that - whichever letters fit. train stops make sense, because it is from back then when the train used to actually be used a lot for vacationers. Bill Murray should pledge - check the opening scene of Broken Flowers - he gets into his car, turns on the car, the radio dial reads 91.1 fm, and the Greenhornes/Holly Golightly track comes on. The North Jersey Coast Line train has never gone to Bayonne, has it? That "B" has to stand for something else. 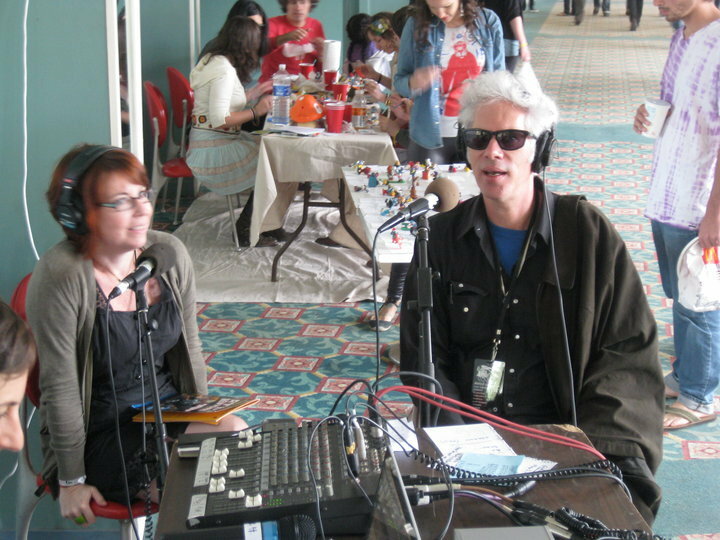 plus Jim Jarmusch has been on FMU at least twice - once with Chris T and once at ATP in upstate NY. I think Therese interviewed him. @Ike: I used to think I was filled with specific details about things. Now I have met you… No dis. Respect only. Matt, I thought you were gonna be my sponsor on "Take a Bennie to Broadway Bar" night this year. I saw Bill Murray at the surf spot, Swami's, in 2005. He had 2 big guys in suits w him, he was wearing a Hawaiian shirt, sunglasses and a pork pie hat. I said hi to him, but wasn't about to blow his cover w some fan boy autograph crap. I mean, come on, it's Bill Murray. Gotta play it cool. But at the end of the day, “Bennies” are visiting tourist Richie Rich’s who just come and go. Way to alienate all of New Jersey. A few years ago, I think I spotted Bill Murray at the rose garden at the Vanderbilt Mansion in town here. He may have been here researching for his role in an FDR movie. Are you folks still at it? Good for you! Okay… Here is a new talk show idea, “Bennie and the Matt.” Nuff said. Think about it. 1 hour a week of this. Road trips. Remotes. Maybe get Uncle Floyd on every once in a while. I do love how Rza and Gza keep saying his name when talking to Bill Murray in Cigarettes and Coffee. I've seen uncle floyd perform at the shore area a few times, it is even more incredible than his usual shows! @JoeB: Envious! He seems so genuine! I sent in a postcard when I turned 11 in 1979 and he announced my name on the air. Such a memory! And I do regret not seeing him at the Bottom Line. So hey. Did see him in Williamsburg at the dance of the Giglio. At a distance, so hey. @rw: Ciccone Youth = YOU! Fullerton! Gateway to Yorba Linda! fleep, I was in Yorba Linda just today. @fleep: Is that a Nixon dig? Oh, I saw a guy with a Chaplin/Hitler mustache today. Non-ironic. Not a hipster. Not a comedian or mass murderer. Oh, and I forgot. Yorba Linda is where the Nixon Library is. Pat is still taking his dog to the studio? I like how they made up different words for this song. Back to Yorba Linda... My daughter's high school teacher was banned from the Nixon Library because he coached his students on what questions to ask during the field trip. Getting banned from the Nixon Library is an honor and a mark of courage, good for him. She said he was one of her favorite teachers. Banned for life. Well, NASA is willing to ship Will.I.Am songs to Mars. I'm sure they can be lured into shipping some WFMU Marathon prizes there too. @BadGuy Zero: "Guffaw" I applaud your sense of humor.